As I wrote on Saturday, the red shirts takeover of the central shopping and business district was a very good move and created significant momentum for their cause. They have refused to leave, their numbers have increased and the government is on the defensive. If the government uses force, it will galvanize support for the red shirts. If not, the red shirts won’t leave. As with any negotiation, you look at the momentum to see who is winning- at this point the red shirts have all the momentum. The government is forced to go on TV with messages to the people while the red shirts have major bargaining power in the form of their protest site. How different this is from the USA. I now understand why protests in the USA don’t work- we never have the massive number of protestors that are fully committed to a cause that will destabilize a key city or function. Local, state and government officials are quick to stop any demonstration from gaining momentum or attaining a significant foothold on which to negotiate. The police and military are also different; force is used quickly in the USA, while not here. One reason for the difference in tactics is diversity of people. In America we are a melting pot of peoples, in Thailand the protestors are all Thai and the police and military are all Thai. Example- if Americans of Mexican heritage are protesting in the streets of San Diego a police force that might be 70% white will be there to enforce law, stop the protest and clear the streets. Everyone is American, but is that police officer in America less sympathetic than a police officer in Thailand when the police officer in Thailand might be from the same town, and hold the same political values, as the protestors they are assigned to stop? 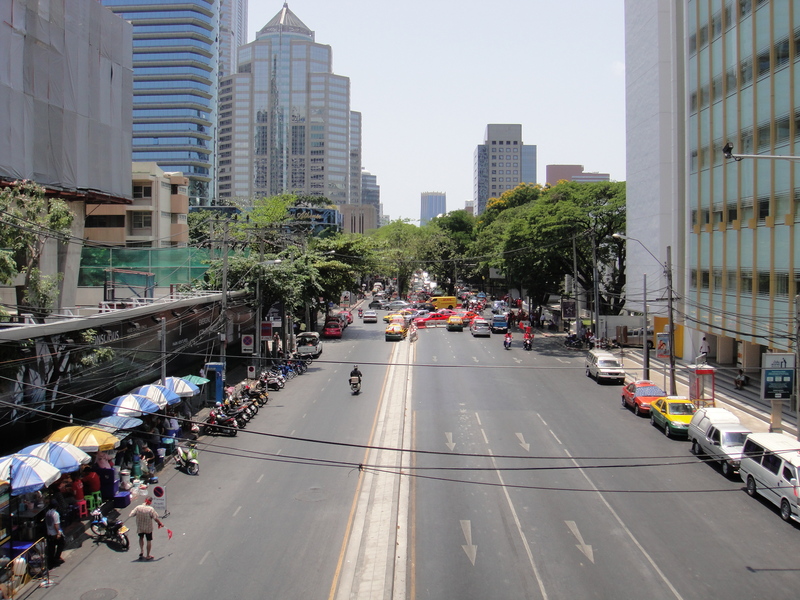 Today was a national holiday in Thailand, a break for the government as traffic was eased around Bangkok. 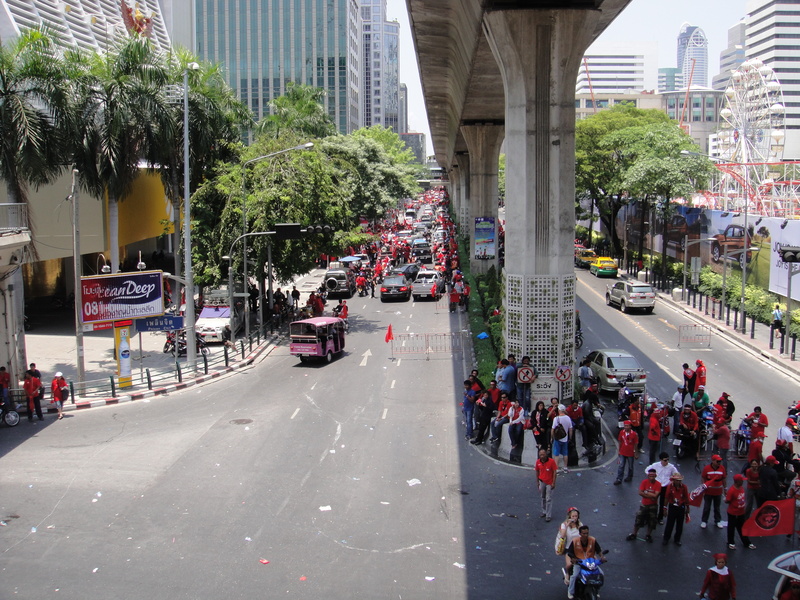 The red shirts were sending large groups around the city to protest- the government banned this, fearing the red shirts would attempt to take over another major center of commerce. estimated increase in the situation, i.e. a government response. I ventured into the 95-degree morning heat for my run and was greeted by 5,000 police in the “storm trooper” outfits in Lumpini park; Lumpini park is within 2k’s of the main protest site. The police descended on the protest site, determined not to let the protestors out on their mobile parade and protest. 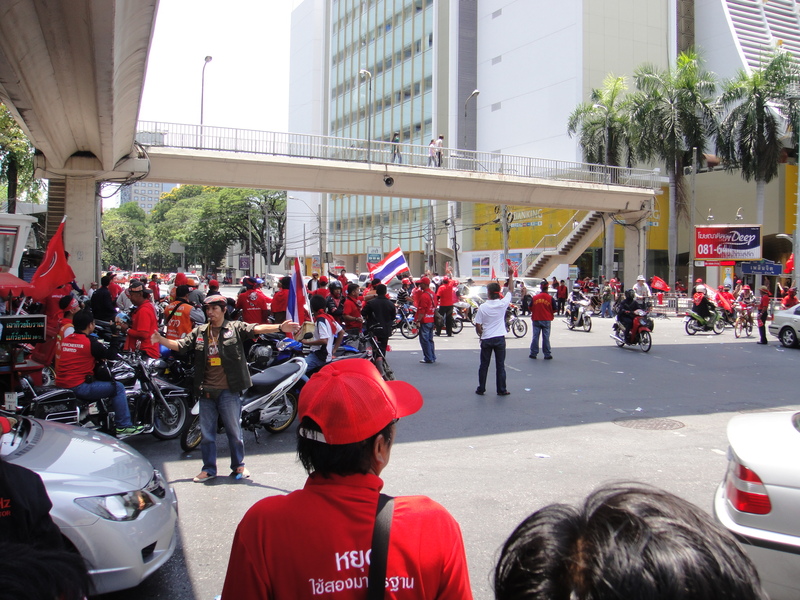 The red shirts held their ground, the police blinked and withdrew and the red shirts had their mobile rally all day. Advantage red shirts. I was shocked how well organized the red shirts are. As soon as they received word about the police in Lumpini, they dispatched their own security guards with mobile phones to monitor the police progress. They also began to block intersections between Lumpini and the protest site with taxi cabs, they put their own “police” in the intersections to help direct traffic; I know this as the major road where I live was under red shirt control by 10:00. There were a few scuffles today, but all turned out peaceful. The red shirts were very happy on their parade and out in force. 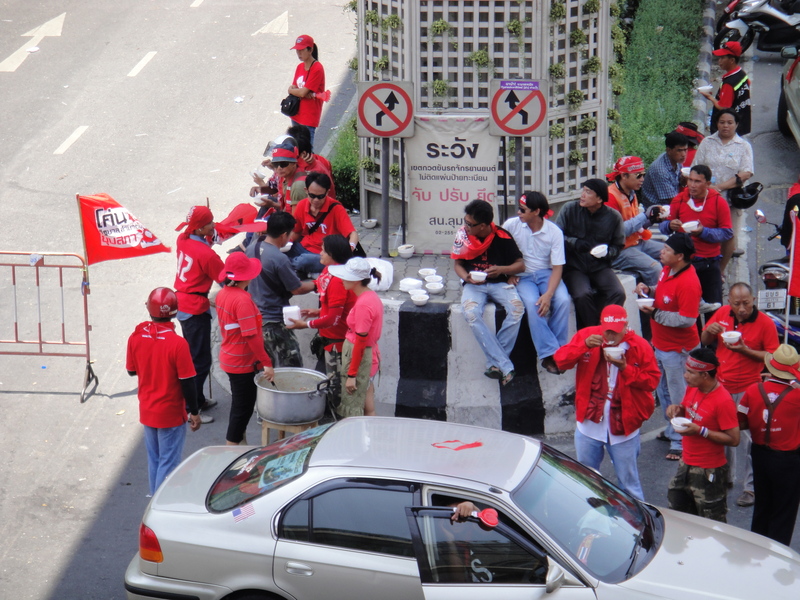 The red shirts have called all supports from around Thailand to come to Bangkok; the government is saying they will remove the red shirts from the central rally point. Unfortunately I think things turn ugly from here, without the red shirts leaving their protest site or the government dissolving as the red shirts request, negotiations are at a standstill, and that is never a good thing. This entry was posted in Bangkok, Politics, Thailand and tagged Bangkok protest, Red Shirts in Bangkok, Red Shirts Protest, thai politics. Bookmark the permalink.